First time buyer and need a trusted service? Simply don't want to waste hundred to thousand of $ hoping to get your favorite Heroes. If you are new players, I can help you with my knowledge of the game. Simply visit one of the website or scroll down for Limited Deal then message me on Discord, Skype , Line or Kik. All my Accounts are Legit rolled/No Interfering Game File. No Modded/Hacked/Duped Involved. There are 2 types of High Risk Accounts. Scroll down to bottom to identify those 2. There are many Hacked/Modded ML 5* that being sold and mark as Legit. Example: ML ken + Luna | ML Ken + 5* for $100 or even $70. Be aware to purchase one. All Middleman outside of Epicnpc Trade Guardian with Email/Discord/Facebook is a scam. More info: Newest Limited Nuker Waifu: Luna with Top Tier Buffer Dps: Aramintha, Top tier Dps: Lidica, Tanky Dps: Charlotte & Arena Dps: Baal. Have all gifts since day 1 and able to summon 4 Moon Lights Heroes when reach Chapter 10-10. More info: Newest Limited Nuker Waifu: Luna with Top Tier Buffer Dps: Aramintha, Top Tier Aoe/Single Nuker: Young Kise & Top Tier Debuffer Dps: Iseria. Have all gifts since day 1 and able to summon 4 Moon Lights Heroes when reach Chapter 10-10. More info: Newest Limited Nuker Waifu: Luna with Strongest Wind Nuker: Yufine & Top tier Buffer Dps: Aramintha. Have all gifts since day 1 and able to summon 7 Moon Lights Heroes when reach Chapter 10-10. More info: Newest Limited Nuker Waifu: Luna with Top Tier Dps : Aramintha, Top Tier Tanker: Charles & Arena Dps: Baal. Have all gifts since day 1 and able to summon 3 Moon Lights Heroes when reach Chapter 10-10. More info: Newest Limited Nuker Waifu: Luna with Debuffer Dps: Tenebria, Buffed Basar & Dps: Violet. Have all gifts since day 1 and able to summon 7 Moon Lights Heroes when reach Chapter 10-10. More info: Newest Limited Nuker Waifu: Luna with Cleave God: Vildred, Godly Tanker: Charles & Dps: Ken. Have all gifts since day 1 and able to summon 5 Moon Lights Heroes when reach Chapter 10-10. More info: Newest Limited Nuker Waifu: Luna with Godly Tanker Dps: Charles, Gps : Lidica & Dps: Ludwig. Have all gifts since day 1 and able to summon 5 Moon Lights Heroes when reach Chapter 10-10. More info: Newest Limited Nuker Waifu: Luna with Cleave God: Vildred, Top Tier CC Tanker: Cecilia & Dps : Violet. Have all gifts since day 1 and able to summon 3 Moon Lights Heroes when reach Chapter 10-10. More info: Newest Limited Nuker Waifu: Luna with Cleave God: Vildred, Top Tier CC Tanker: Cecilia & Tanky Dps: Charlotte. Have all gifts since day 1 and able to summon 7 Moon Lights Heroes when reach Chapter 10-10. More info: Newest Limited Nuker Waifu: Luna with Best Tanky Dps: Krau, Top Tier Dps: Aramintha & Dps: Ludwig. Have all gifts since day 1 and able to summon 4 Moon Lights Heroes when reach Chapter 10-10. More info: Newest Limited Nuker Waifu: Luna with Strongest Hybrid: Haste, Ravamped : Dps, Ken & Arena Dps: Baal. Have all gifts since day 1 and able to summon 3 Moon Lights Heroes when reach Chapter 10-10. More info: Newest Limited Nuker Waifu: Luna with Top Tier CC Tanker: Cecilia, Top Tier Bleeding Dps: Sigret & Dps : Ludwig. Have all gifts since day 1 and able to summon 6 Moon Lights Heroes when reach Chapter 10-10. More info: Newest Limited Nuker Waifu: Luna with Recently Buffed Dps: Basar & Top Tier CC Tanker : Cecilia. Have all gifts since day 1 and able to summon 6 Moon Lights Heroes when reach Chapter 10-10. More info: Newest Limited Nuker Waifu: Luna with Strongest Hybrid: Haste & Top Tier Debuffer Dps: Tenebria . Have all gifts since day 1 and able to summon 5 Moon Lights Heroes when reach Chapter 10-10. More info: Godly Combo Bellona + Aramintha that give 50% Attack Buff and 50% Defense Break with Best Healer: Destina & CC Support Tanker: Tywin . Have the strongest 4* Healer: Angelica. Have all gifts since day 1 and able to summon 5 Moon Lights Heroes when reach Chapter 10-10. More info: Godly Combo Bellona + Aramintha that give 50% Attack Buff and 50% Defense Break with Strongest Hybrid: Haste, Top Tier Dps: Sigret & Good Dps: Ken. Have all gifts since day 1 and able to summon 5 Moon Lights Heroes when reach Chapter 10-10. More info: Godly Combo Bellona + Aramintha that give 50% Attack Buff and 50% Defense Break with Best Healer: Destina & CC Support Tanker: Tywin . Have the strongest 4* Healer: Angelica. Have all gifts since day 1 and able to summon 7 Moon Lights Heroes when reach Chapter 10-10. More info: Strongest Meta Supporter: Diene with Strongest Wind Nuker : Yufine & Support Tanker: Tywin. Have all gifts since day 1 and able to summon 5 Moon Lights Heroes when reach Chapter 10-10. More info: Strongest Meta Supporter: Diene with Top Tier CC Tanker: Cecilai ksut buffed & Top Tier Buffer Dps: Aramintha. Have all gifts since day 1 and able to summon 3 Moon Lights Heroes when reach Chapter 10-10. More info: Newest Limited Waifu: Luna with Top Tier Debuffer Attack: Aramintha, Defense Aoe Defense Break : Tenebria & Strongest : Haste , Strongest Pve Fire Dps : Ravi , Top Tier CC Support Tanker: Tywin. Have all gifts since day 1 and able to summon 5 Moon Lights Heroes when reach Chapter 10-10. More info: Newest Limited Nuker Waifu: Luna with Strongest Wind Nuker: Yufine, Strongest Fire Pve Nuker: Ravi with Top tier Buffer Dps: Armaintha & CC Support Tanker: Tywin. Have all gifts since day 1 and able to summon 5 Moon Lights Heroes when reach Chapter 10-10. More info: Newest Limited Nuker Waifu: Luna with Godly Aoe Machine Defense Break: Bellona & Strongest Wind Waifu: Yufine . Have all gifts since day 1 and able to summon 3 Moon Lights Heroes when reach Chapter 10-10. More info: Godly Combo Bellona + Aramintha that give 50% Attack Buff and 50% Defense Break with Best Tanky Healer: Krau ,Strongest Fire Pve Nuker: Ravi & Strongest Wind Nuker: Yufine. Have all gifts since day 1 and able to summon 5 Moon Lights Heroes when reach Chapter 10-10. More info: Limited Waifu Dps: Luna with Godly Supporter/Healer Tamarrine that considered to be equal Diene, Best Healer: Destina, Top Tier Dps: Sigret. Have all gifts since day 1 and able to summon 5 Moon Lights Heroes when reach Chapter 10-10. Guaranteed 100% safe. No Modded/Hacked Involved. More Info: One of the Considered Opest Unit Meta: ML Aramintha that can do Aoe Stun Combo with Aramintha that can melt entire Enemy team in several turns. Have extra 5* ML Vildred & ML Corvus Have Limited Dps Waifu: Luna. . Top Tier 5* Heroes Available: God Aoe Defense Break Machine Bellona, Destina, Cermia, Krau, Aramintha, Lidica, Sez , Charles, yufine, Uoung Kise. A lots of resource that will guaranteed new Limited Collab Banner from Japan Guity Gear. One of the best account for New Players or Veteran that want to do any contents and want an Unlinked account. More Info: One of the Considered Opest Unit Meta: ML Aramintha that can do Aoe Stun Combo with Aramintha that can melt entire Enemy team in several turns. Have Limited Dps Waifu: Luna. The Nuke King: ML Schuri , Fastest Asassin: ML Coli. Top Tier 5* Heroes Available: Godly Supporter/Healer: Tamarrine that considered to be equal Diene, Haste, Sez, Krau , Aramintha, Cleave god: Vildred , Lidica. A lots of resource that will guaranteed new Limited Collab Banner from Japan. One of the best account for New Players or Veteran that want to do any contents and want an Unlinked Account. More Info: One of the Considered Opest Unit Meta: ML Aramintha that can do Aoe Stun Combo with Aramintha that can melt entire Enemy team in several turns. Have Limited Dps Waifu: Luna. Healing Mage Queen : ML Aither , Strongest Dark Nuker: AxeGod. Top Tier 5* Heroes Available: Godly Aoe Defense Break Bellona, Krau, Lidica, Yufine, Cleave God : Vildred. A lots of resource that will guaranteed new Limited Collab Banner from Japan. Great account for New Players or Veteran that want to do any contents. More Info: One of the Considered Opest Unit Meta: ML Aramintha that can do Aoe Stun Combo. Extremely good Top Tier 5* Heroes with a lots of resource that guaranteed Japan Banner. Perfect for starter who want ML Aramintha. More Info: One of the Considered Opest Unit Meta: ML Aramintha that can do Aoe Stun Combo with Aramintha that can melt entire Enemy team in several turns. Extremely Godly Top Tier Moon Light 4* : ML Dominiel, Dps Healer: ML Dingo, Healing Mage Dps: ML Aither, The Nuke King : ML Schuri, Strongest Dark Nuker: AxeGod. Have Duo Limited Strongest Meta Supporter Diene & Dps: Luna. Multiple Top Tier 5*: Godly Supporter/Healer Tamarrine that considered to be qual Diene, Cermia, Sez, Krau, Charles. Good amount of Resource for future banner. Perfect for Veteran players. More Info: The Opest 5* Heroes in game: ML Ken with limited Dps: Luna. More Info: New Buffed ML 5* that become Godly: ML Tenebria with God tier 4* Moon Light: ML Dominiel , ML Coli - Fastest Assassin. Have Duo Limited Strongest Meta Supporter Diene & Dps: Luna wit her own Artifact Sigurd making her able to sustain and deal massive damage. Have multiple Top Tier 5* Heroes : Godly Defense Break Machine BEllona, Young Kise, Yufine, Sigret, Krau, Sez. Perfect Account for Starter who want ML Tenebria with duo Limited with God Tier 4* & 5* Heroes. More Info: Stun Machine ML Sez with God tier 4* Moon Light: ML Dominiel , ML Clarissa - Best Debuffer , ML Carjuta - Best Dps supporter , ML Schuri - The Nuke King . Limited Dps Waifu: Luna. Have multiple Top Tier 5* Heroes : Godly Supporter/Healer: Tamarrine, Lidica, Sez, Tenebria. Perfect Account for Starter who want ML Sez with God Tier 4* & 5* Heroes. More Info: Good Fresh Starter Account for anyone who want ML Tenebria and ML Rose. More Info: One of the Considered Opest Unit Meta: ML Aramintha that can do Aoe Stun with Limited Heroes: Luna. Have multiple Top Tier 5* Heroes: Cermia, Destina, Ken , Charles, Young Kise with extremely Good Artifact. Perfect for any starter. More Info: Double 5* ML Sez + Ruele. ML Sez is buffed that become a Stun Machine. Have Limited & Luna with multiple Top Tier 5*Destina, Aramintha, Charlotte. Godly Supporter/Healer: Tamarrine that consider to be equal Diene. Have Multiple God Tier 4* Moon Light: Aither & Clarissa .The account is perfect for new player or veteran who want to experience The Stun Machine ML Sez & Waifu: ML Ruele. More Info: The God Tier & Popular of 4* Moon Light Heroes: ML Dominiel, ML Armin, ML Schuri, ML Achates , ML Mercedes. Have Duo Limited Strongest Meta Supporter Diene & Dps: Luna. Have multiple Top Tier 5* Heroes: Haste, Destina , Sez, Ken , Cecilia , Vildred with extremely good Artifacts. Perfect account for Starter or Veteran that don't want to spend any more $. More Info: The God Tier & Popular of 4* Moon Light Heroes: ML Dominiel, ML Karin, ML Aither, ML Schuri, ML Achates , ML Mercedes. Have Duo Limited Strongest Meta Supporter Diene & Dps: Luna. Have multiple Top Tier 5* Heroes: Cermia , Krau , Godly Supporter/Healer: Tamarrine, Iseria, Young Kise , Cecilia with extremely good Artifacts. Perfect account for Starter or Veteran that don't want to spend any more $. More Info: The Opest Unit in game: ML Ken with Limited Waifu: Luna. Strongest Supporter : ML Armin with Goddess of Arena: ML Rose . The Nuke King ML Schuri. Simply hae all the Top tier 5* Units with multiple Copies. The account is still Mid-End & perfectly fit for Veteran who want to start Starters. More Info: Your Godly Moon Light Chloe with Strongest Meta Limited Supporter: Diene & Limited Dps: Luna with perfect match Artifact. 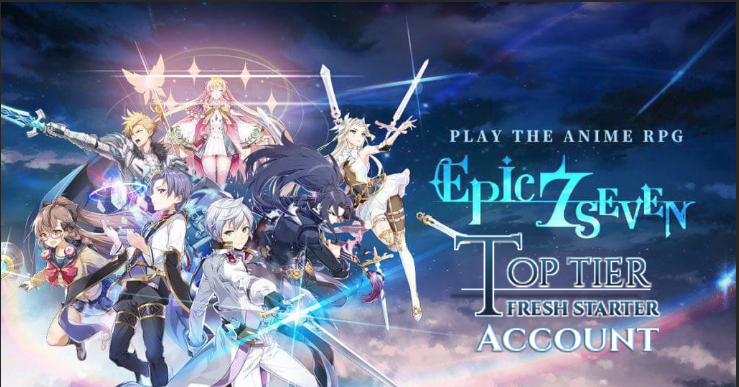 Over 2500+ Satisfied Customers on Epic7! Official Statement Released on April 18th 2019. Moon Light Ken/Kise/Chloe or basically every Moon Light Units with Name of Chinese/ Can change Name tend to be Hacked/Modded one. - Day 1 - 10 Logs in. - Have a single 5* from Selective Summon. - Has good amount of resources. - Can Instant clear map without needing any unit. - Interfering game file heavily. These one not even used mod to clear map. Modifying files and duplicated units. Similar to other mobile games as "Injection"
- Extremely High Risk. 110k Accounts banned because of these. Bought an account, easy and fast! bought twice! easy and fast! A reliable seller! I mean, look at all those feedbacks lol. Even after purchase, still will guide on how to change email and password. Good seller, would recommend to anyone, helped me get the account I wanted. Highly recommend! Very fast and responsive! Very trustworthy! I will always go to setsuna first going forward with all the accounts I want as the support has been consistently good every time i've contacted . He helped me search for what I wanted and he kept a look out for me even when he did not have it. Really great seller. Great seller! Very accommodating and friendly! Helped me find the perfect account!